Please refer to our stock # 1815 when inquiring. Dzi beads: (7) 103 grams. Cold, smooth heavy, root beer color. vary approx 40mm x 15mm. 3 of which have 9 eyes and the other 4 have 3 eyes each. They could be agate or at the very least beautiful lamp work! Although NO bubbles seen. Nonetheless, these have been purified with incense and exposed to the September 27, 2015 super lunar eclipse! Store them next to ancient ones or take them to a Lama. Ancient ammonite specimen: 29 grams and 46 x 45mm round showing dendritic patterns on outer edges, it is encased in a hand wrought hand forged heavy 14 guage semi precious metal. All metal is Sterling silver: ~ 45 grams or 1.5 oz on postal scale. 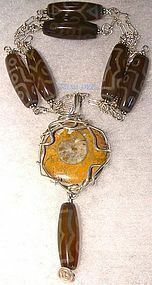 Dimensions: The necklace by itself is 34" end to end with heavy "paper clip" motif segments and 6 Dzi beads, ending in a hand wrought stamped "S" shape hook. 2 piece pendant: north to south 5 1/2 x 2", ending in a hand hammered lucky spiral. Condition: new. Wear this all year round. Over your cashmere pullover, or poncho and in the summer over sand color linen. Auspicious spiral and eye amulet motifs. $24 USPS Priority/Ins/Track with Signature or FREE with your USA Ck or USPS MO.